A celebration of fandom in its truest sense. What Regina can't wrap her mind around is how the people can be so loyal to Snow White when she is their Queen. She enlists the help of Rumplestiltskin (always a wise choice) so that she can disguise herself and go among the people. Perhaps then she will learn more about her arch-enemy's whereabouts. She is warned, though, that she will not be able to use magic or transform back without his help (which, of course, he doe not provide). When she enters a village that has strewn up an effigy of the Queen, she tries to stop them, only to be mistaken for the culprit by her own guards. She is saved, to the delight of the irony gods, by the woman she has been hunting. Snow dispatches the guards, rescues Regina, and takes her to hide in the woods where she nurses her back to health. "Oh dear God just kill me now." Snow tells the injured girl about the time she almost fell off a horse, and a woman saved her. As they walk through the forest, Snow White tells the "peasant girl" that she believes there is still good in Regina. Regina takes this to heart, and wonders aloud if "The Queen" were to repent and ask forgiveness, if Snow would grant it, or kill her. Snow shows the truest kindness and compassion and says that she would. That is, until they find the bodies. In a very un-Luke Skywalker-like speech, Snow realizes and declares that there's no possible hope for Regina's redemption. She is evil through and through. The cloaked Regina accidentally reveals her true self by asking about the horse incident, although in Snow's telling she never said it was Regina. Snow readies her arrow, and a powerless Regina flees. Ever the fairest, Snow lets her go. Back in Storybrooke, Regina is planning to activate the failsafe for the Curse, one that would destroy Storybrooke and everyone in it. Using the last remaining magic bean (oh, yeah, she burned the rest of the crop), she will escape with her son back to the Land That Was and make him love her once more. Oddly, she tells Henry about her foolproof plot, only to erase his memory moments later. Meanwhile, Emma bumps into Tamara at Granny's and notices something strange when she helps to pick up Tamara's spilled items. She has a list (a big list, with big print...not so stealthy, eh?) of all the names of Storybrooke's residents and their true identities. Emma begins to think that Tamara is the "She" that August was trying to warn them about before he re-youthified. "Hi, I'll have a cup of coffee, milk, two sugars...oh, and the heads of everyone in town." And so, Emma and Henry renew their covert partnership, renamed Operation Praying Mantis (...oy), in order to find out exactly what she's up to. A botched reconnaissance mission at Neal's apartment leads them to a dead end. But Emma's lie detection powers are not mistaken. Tamara and Greg are up to something, and they need a helping hand in their scheme. Well...helping hook, that is. Regina, trying to enact her own plot, also teams up with Hook, who seems to earnestly want to renew the partnership he had with Cora. 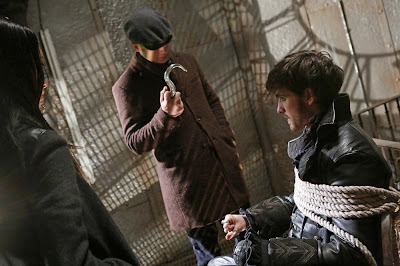 Regina leads hook to the Library and down the elevator where she recovers the failsafe. But, she needs a distraction, because a certain dragon-moprhing witch is not as dead as we thought she was. I actually loved this idea. It shows a particularly cruel side to Regina that she would keep her most hated frenemy preserved so that she could guard Regina's most sacred treasures. First as a dragon, then as a skeleton-ghost thing. This version of Maleficent was particularly shiver-inducing. But, Hook does manage to escape, with the help of his newfound friends, Tamara and Greg. It appears that they have a bit more experience dealing with magic than we originally thought. Using the power of science, they effectively stunted Regina's powers and put one check on their list of names. They are truly coming into their own as the new villains of Season 2. I predict that they will learn about Regina's failsafe and endeavor to use it to bring about the end of magic....and the destruction of Storybooke. That would certainly be quite a hook...ah ha..get it? 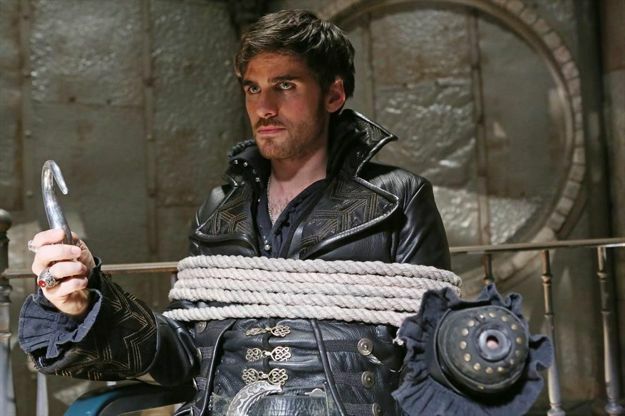 A..hook....Okay I'll stop. Overall, I think this idea of a misunderstood Regina has been played out. It worked well in the first third of the season, when she was trying to do right by Henry, and a new twist was thrown in when Cora arrived in Storybrooke, but now it's a bit tired. She needs to commit to either being good (although not necessarily accepted by the townspeople), or truly embrace the dark side. Frankly, I would like to see an anti-hero in Regina, especially up against an all-powerful Rumplestiltskin. She doesn't need to be a good guy, but she should stop playing the victim. That said, I really enjoyed seeing Regina and Rumple play off each other in this episode. Each time we see them together she is either the eager student, the defiant former pupil, or the ardent rival. 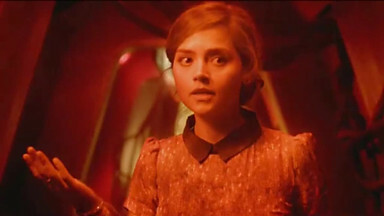 But, as always, the imp seems to always have the upper hand. I also really enjoyed seeing Tamara and Greg's characters develop into a much more sinister duo than we previously thought. I am extremely eager to see how their roles play out as we enter the home stretch to the finale. Joe Sorbera is a proud fan known to be quoted as saying "That was the best (insert thing here) ever!" every...single...time. This blog's title is an homage to his namesake. #336 - Ryan and Leah: At the Movies - Halloween Horrors and lots of Trailers!